Yesterday we counted, selected and treated all the parrots that were confiscated in Douala Airport two and a half weeks ago. With 7 people we worked from 7am to 5pm, but in the end we had done all the parrots. There were many more birds than we had estimated! We now know that the total amount of parrots seized was 503. 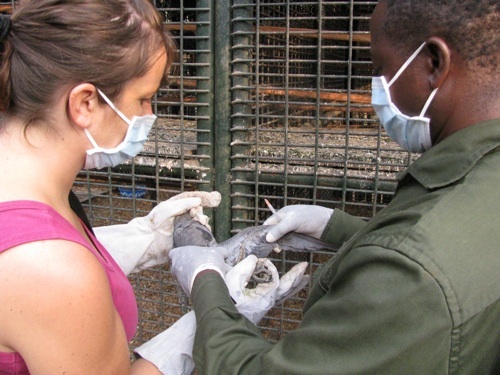 All of them were stuffed in 10 wooden boxes and arrived in terrible circumstances in the Limbe Wildlife Centre. This number explains why the parrots are eating so much. We spend about $45 per day on food for the parrots. We really can use all the support you can give us. Please do a small donation through the paypal option on this page. We are very grateful. 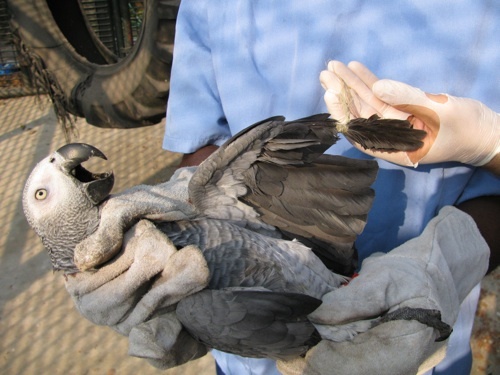 In order to treat the parrots for parasites and to assess their health each parrot has to be caught separately. A lot of the parrots are too skinny and have clipped wing feathers. The parrots in this shipment hardly had glue on their wings, which is something we have seen a lot in earlier parrot shipments. Parrots are often caught by applying glue into a basket and then placing a live parrot inside the basket. Other parrots then come to see what is happening and get stuck in the glue. On the other hand, this time we found a lot of birds with their feathers tied together, which is something we have not seen before. The good, healthy flyers were then placed in one room and all the others in another room. The total amount of flyers is 176. In ten days time the treatment against psittacosis will be finished and we will then start with the release of the flyers. The other animals will have to spend more time in the LWC in order to become healthy and strong.